i have some ideas and questions about the tallest book in the world project that i wanted to run by all of you lovely participants… but first i have some thank yous! thank you also to miss maggie mannwieler for sending me a spool of binding thread. you rock, lady, and i thank you so much! i wanted some input from all participants on the charity in which this book will benefit. my suggestions seemed well received by so many and no one has (as of yet) made any other suggestions but i welcome all thoughts and ideas. as a recap, my ideas were something having to do with any or all of the following as they are daily aspects of my life as a mother and an artist: kids, art, aspergers/autism. along the vein, i have researched a few non-profit organizations but have some more work to do and contacts to make before i list them out. i promise to share more later and snap-shots of other’s pages as they come in. i know it currently looks like a cover but i’m mystery girl — it will have a photo and other bits on top, and lots of secrets inside once i share it. as of yet, there is no specific deadline. i’m loosely thinking the end of the year. i want this to be TALL so don’t want to put a firm date on it until i know how many pages we end up having, etc. pretty please request: when you mail your page(s) in, please include: name, location in the world, URL to website or blog. please also send a photo via email with a shot of your page(s) to hi (at) altered bits (dot) com so i can keep it all straight. it doesn’t have to be a good photo — this will just be for my visual reference so i don’t mess anything up when it comes to giving proper credits. you are welcome to put your name and url on your page(s) — i have had a lot of questions about this. but you don’t have to — the last page will have a pocket and i will list the page number, artist, location and url so you will be credited no matter what. pages will be put into the book in the order received unless there will be a binding issue of some weird sort, though i can’t imagine that will be the case. each flower and little piece is hand cut — it was fun! ingredients: collage, acrylic, water color pencil, ink, crackle. i hope you’re all having a fab start to autumn (on this half of the planet) or start to spring (the other side). i’ve been working away on some serieses (that’s not a word, i know), some commissions and some collaborations and will be sharing those here soon. happy book page making to all! i’m off to work on mine right this second. miss maggie, i can’t wait to see your pages! 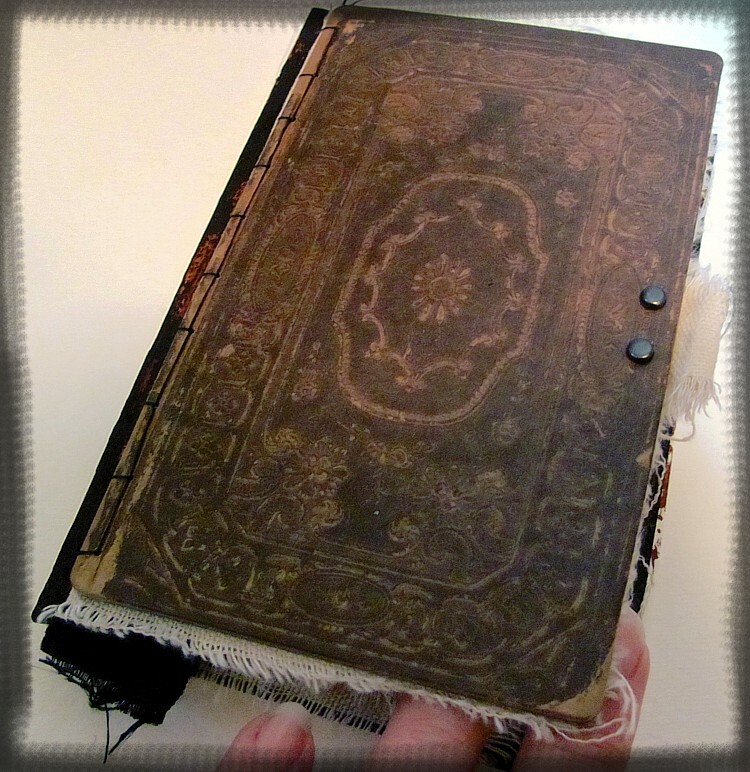 yes, so far my first page looks like a cover, but a photo is going on the top of that and some other bits, and then inside the “cover” (which is a door), there are secret bits. i suppose i could have shown a more progressed photo but i like to be mysterious sometimes. 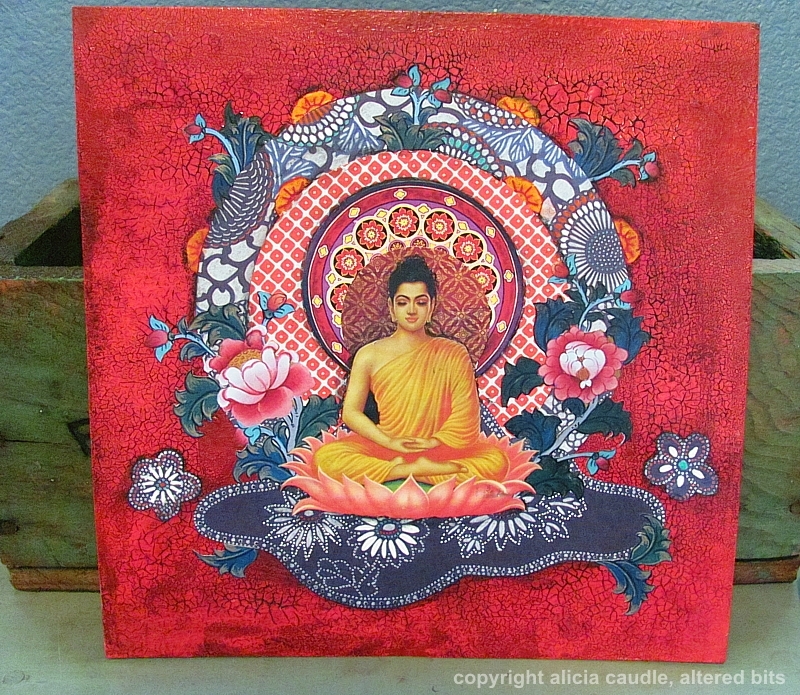 Fantastic buddha collage! And I love your page…. swoon. Beautiful, sublime, divine Alicia. Your art and your incredible brain ROCK!